If you are facing an aggravated assault charge it is crucial to have an attorney with a proven track record in defending against serious criminal charges. 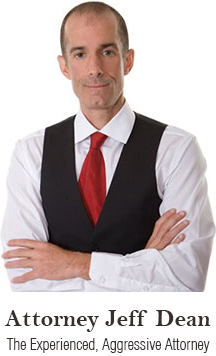 Jeff Dean has that track record with a 20 year history of winning many serious criminal cases. Mr. Dean’s distinguished record includes having laws struck down as unconstitutional, winning landmark and precedent setting cases, and repeatedly saving immigrants facing charges from being deported. He has won many DISMISSALS of assault and domestic violence charges, and in other cases he has had felony assault charges reduced to a simple misdemeanor disorderly conduct or misdemeanor assault. Mr. Dean has even won NOT GUILTY verdicts in serious felony cases where there was overwhelming evidence of guilt. In your case Mr. Dean will identify the best defense strategy and he will fight to win. Possible defenses are that you acted in self-defense, the accusations were fabricated or exaggerated, or that you did not have the intent to cause the harm. Under the law you are presumed innocent. Because you have been charged with aggravated assault does not mean you are guilty. Aggravated assault is defined as an assault with a weapon without intent to kill, or an assault (with or without a weapon) with the intent to commit a felony. Assault doesn’t mean that you have carried out the threat but rather that the threat was made and it was possible for the threat to be carried out. For example, you may be looking at an aggravated assault accusation if you have pulled a knife on someone or if you have pulled a gun out on someone. If you have threatened to hurt them without a weapon, and there is no intent to commit a felony, then this is considered a misdemeanor assault, is not deemed ‘aggravated’ and not as severe in the eyes of the law. However, any assault accusation aggravated or not, is going to have serious criminal and collateral consequences. You could be sentenced to jail, large fines, restitution, and numerous restrictions on your civil liberties. Either of these convictions will remain on your record and will make it very difficult to find a decent job and to secure a home. If you are not a United States citizen you could be deported. The lawyer you choose may be the most important decision of your life. Contact defense attorney Jeff Dean today at (305) 967-6311 or (954) 204-3633. There must be proof of intention to hurt or to cause fear. A misdemeanor assault is an intentional threat to do violence to another person, coupled with the apparent ability to do so, and doing an act which creates a well-founded fear in the other person that such harm is imminent. A person convicted of this level of assault is guilty of a misdemeanor of the second degree. There are many defense tactics that Miami attorney Jeff Dean may use in your case. It might be that you acted in self-defense or to defend others. Self Defense is defined as the justifiable use of force; and allows a person to use force, and in some instances deadly force, to protect another or one’s self, so long as the force that is used is proportionate to the threat faced. Another possible defense is that you did not commit the act with the required intent. The state must prove beyond a reasonable doubt that you acted with criminal intent; if there is a reasonable doubt that you lacked this intent then you are not guilty. As discussed above, for both misdemeanor assault and aggravated assault the state must prove that you intended to cause the harm or fear. Miami defense attorney Jeff Dean may argue and prove that you did not have the intent to cause the harm and therefore that you are innocent. These are but just a few of the defense strategies that might be employed in your case. To further discuss possible defense tactics, contact Jeff Dean today. Regardless of the evidence against you and the circumstances surrounding your case, there is always a right and wrong way to handle it. Contacting Jeff Dean as soon as possible will help ensure the best outcome for you. Contact Fort Lauderdale and Miami assault defense attorney Jeff Dean today at (305) 967-6311 or (954) 204-3633.